These are a collection of short educational drills/games to play throughout class. These are ideas for teaching vocabulary, grammar, and some questions/answers games. ​ I will continue to add ideas as they come and put them at the top of the page. All students sit on the floor in front of their chairs. During the English drill, the Teacher will call on a student to guess red or black. (guess the color of the poker card the teacher has) If the student guesses correct, they may sit in their chair. The game continues throughout teaching until one team has all reached their seats, OR until the teaching drill has been taught. At that point the team with the most students that made it back to their chairs is the winner. This can also be used with QnA, Grammar and Reading. Every 20-30 seconds a student that has completed an English task, may play and guess. All students sit on the floor in front of their chairs. The teacher instructs students to take part in an I say – you say, style of teaching the content at hand. Every 30 seconds to a minute (after repeating the content clearly) the war begins. Each student guesses which poker card the teacher is looking at. (2 – Ace). The students are asked from left side of the room to the right side of the room in a quick manner, with the teacher simply responding yes/no to the guesses. When a student guesses the card, that student is the winner and may sit in their chair. They may also help a student from their team to sit in their chair OR “Kill” a student from the other team by shooting them back down to the floor from their chair. The first team to get their entire team seated in their chairs is the winner. OR When the drill has been taught to its finish, the team with the most students sitting in their chairs is the winner. *Each round of guessing start from the opposite side of the classroom to keep odds of guessing fair. *Guesses must be quick, other wise the teacher will say “NO” and move onto the next student. *This is a great game for classes that must do lengthy sentences throughout their drills. Example of Teaching Vocab: Each word is taught phonetically, then translated, then the teacher says 2-3 example sentences using the vocab word. Then a round of quick war. Example of Teaching Grammar: Teach 2-5 sentences using the grammar, then play a round of war. Example Reading: Have the class read after the teacher, for a minute or so, then play a round of war. Example Q n A: 3-5 students Ask questions, or answer questions then play a round of War. Vocab review: Say and repeat 7-15 flashcards, then play a round of War. These sticky notes are then spread around the classroom/school. To play the game split the kids up into pairs. The kids will then choose who is the scribe and who is the messenger. The scribe's job is to stay in the classroom and write down what the messenger tells them. The messenger's job is to run around, find the notes (messages), read them, remember them (NO REMOVING THE NOTES AND BRINGING THEM BACK TO THE CLASSROOM), then go back and tell the scribe. First team to collect all the messages wins. Q: What did she make? A: She made a pizza and some french fries. This game has one student practicing reading and speaking and the other student practicing listening and writing. You can play it twice and have the students swap roles so that all students have practiced all aspects of the language. It also encourages team work and tests their grammar when making the questions. This is a step 2 grammar Drill. Have students sit in front of their seats on the floor. Between the two teams put a stool with a bowling pin on top of the stool as shown below. XXXXXXXX Stool with pin XXXXXXX (X marking students sitting on the floor). The two students sitting next to the pin sit with their hands on their heads. Have students repeat grammar sentences or questions with the teacher. When the teacher makes a mistake the two students must grab the pin. The student that loses is out and sits in their chair. The winning student goes to the end of their line to play again later. The next two students then play. The team that loses all of its members first is the loser. All students must repeat after the teacher whether they are in the game still or “Out”. If a student does not repeat after the teacher, that team loses a player. This drill allows the teacher to say many sentences making a mistake every few sentences so that students get a lot of practice with the grammar by the time the drill is over. If the class has few students I would recommend playing twice, or allowing 2 or 3 lives per student. A good mistake drill for grammar is playing duck duck goose with sentences. If teaching for example “these are” vs. “This is”, first have the students sit in a circle on the floor alternating team members. The teacher walks around the circle touching the heads of students and saying one word of a sentence per head while the students repeat, “these, are, books. This, is, a, pencil. They, are, chair…”. When a mistake is made the student whose head the teacher is touching must try and catch the teacher by running in the same direction as the teacher before the he sits down. 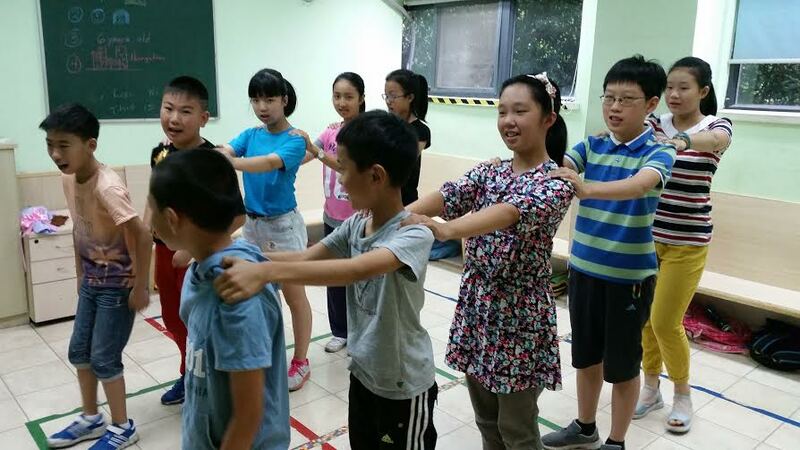 Students make 2 lines and place their hands on the students shoulders in front of them. The teacher will say sentences / questions and answers, for the students to repeat. If the teacher makes a mistake, the students must all squat together. The fastest team to squat together and properly, (not diving and lying on the floor) wins finger points, or points on the board. This is a fun way to make sure all students are paying attention and working together. Teams motivate each other as they are squatting, and also pushing down on the person in front of them to make sure all students participate. This is also great for reviewing multiple tenses. If a student is not repeating after the teacher, be sure to point it out and say the same sentence again, until all are repeating loudly and confidently, only then continue making mistakes randomly. The teacher uses flashcards or vocab from the board to say and repeat words, or grammar sentences with the class. If at any point the teacher says a number (Ex. 3), 3 students from each team must race to sit on a line (or touch an object). The first team to do this wins points. This game is a lot of fun as when a number is called most students first reactions are to all jump up to sit on the line. But only the number of students called should sit on the line. This makes the students work together and race back and forth until the correct number of students are on the line, and the rest of the team is sitting nicely in their chairs. This can also be made much more complicated by calling a number for boys and a number for girls. Also the teacher can call different numbers for different locations. EX 2 Blue line, 1 Yellow line. Each student can be given a small object to place somewhere instead of sitting. In this case they must all get back to their seats after they place their objects. *Using with vocab can be great for reviewing many flashcards, or making the game more complicated as stated above. With Grammar it is fun to throw in a number into the sentence discreetly to keep students on their toes. *If students are not properly repeating the vocab or grammar, be sure to repeat the word or sentence again and remind the class that only when all students are participating in the English drill will the teacher call out a number to play Number Buster. This Grammar game works well for the Side by Side Book. Have students stand up with their books (Or sit on the floor). Read the examples and have the students repeat together after you. For the following grammar examples that students must fill in the blank grammar, the teacher will read the sentence, but fill in the grammar portion with "BLA BLA BLA". EX Book says: Will the game begin soon? at 7:00. The correct answer is : Yes it will. It'll begin at 7:00. Teacher says: Will the game begin soon? Students repeat. Teacher says: Yes Bla Bla Bla. Students repeat. Teacher says Bla Bla Bla at 7:00. Students should NOT say Bla Bla Bla! After each example if the teacher hears a student repeat correctly that student may sit down in their chair. Continue doing examples until all students are repeating loud and confidently the correct grammar together and all have made it to their chairs. This is a great way to continually practice tenses or to teach a new tense while reviewing known tenses. The teacher will say a "Time" and a Simple form "Verb" in a sentence. The class must repeat the sentence together after the teacher with actions. The team that says the sentence loudly and correctly and does the correct "action" gets a finger point. The first team to get to 5 finger points is the winner. Teacher: YESTERDAY I go to my friends house. Students: Yesterday I went to my friends house. Teacher: NOW we are jump on the bed. Students: Now we are jumping on the bed. Teacher : TOMORROW she play football at the park. Students: Tomorrow she will play football at the park. 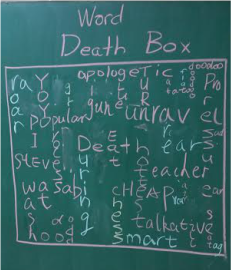 Draw a box on the board with the word "Death" in the middle of the box. Each team takes turns writing words in the box using the existing letters. When a letter is used, the two letters connecting with that letter may not be used. Words must be atleast 3 letters long. The size of the letters must be consistent. The team that takes too long, or cant fit the word within the box loses. The picture is an example of a big long game. The smaller the box the faster the game. Have students from Team A and Team B sit in a line like so. (ABABABABABAB) The teacher sits in front of the students with a ball. The teacher makes example sentences for students to repeat. If the teacher makes a mistake students should stand up quickly. The teacher then lobs the ball lightly in the air towards the first student to stand up. The person that catches the ball regardless of team or who stood up first is the winner and earns points. Students then sit down and resume repeating sentences until the next mistake. First say the Time of the sentence, followed by the sentence. This is great to work on multiple tenses and making mistakes with the verbs. Yesterday, Johnny went to the mall. Now, Johnny is going to the mall. Tomorrow, Johnny will go to the mall. 10 days ago, I ate 3 chickens. Now, we are playing football. On Sunday, she will sit on a dragon. Last Friday, I didn't go to the movies. Now, We're not flying to the moon. Next year, I won't practice piano. Yesterday, We go to the mall. *If students stand-up when a mistake was not made, be sure to repeat the sentence again so there is no confusion. Have students stand in a line in front of the teacher. The teacher will have a ball which is appropriate to throw at students. The teacher will make example sentences with the grammar and have the students repeat after. If the teacher makes a mistake, students should "Hit the Deck", as in sit down or lie on the floor. If a student is last, or too slow, the teacher tries to throw the ball and hit that student. If the student is hit while not in the chair, or on the floor the opposite team is then awarded points. The game continues for 5 minutes, or until students are tired. Students should sit on the floor in a line facing the board. The vocab should be written vertically on the board so all students can easily see it. The teacher then makes sentences using one word from the board per sentence. The teacher should use the vocab out of order so that students must find the word. After the sentence has been repeated by all students, the teacher will throw a ball to a few students. Those students must instantly throw the ball back to the teacher. If the student cannot say the next word on the board by the time the ball goes back to the teacher they are "Out". *This is helpful to have students saying and repeating grammatical sentences and also learning the new vocab by finding the word being used, and also seeing which word is under it. *When students are "Out" they must continue to repeat after the teacher or another student from their team is then "Out"
*The last student is the winner. *If the word is mispronounced then the student is also "Out"
*If the student cannot catch and instantly throw the ball back with the teacher catching it, that student is "Out"
Students must line up standing on a line. They must keep their feet on the line at all times. If a student takes their foot off the line or moves their feet then the other team is awarded points. The students are only allowed to take their feet off the line when the teacher makes a mistake, at which point the students must sit down or the teacher will eat them. You can try to psyche the students out to make them move their feet. When a student makes a mistake, or gets "psyched out" and moves, that student is eliminated. The last student standing is the winner. *For Younger Classes: If a student makes a mistake the other team can be awarded a finger point so that all students continue to play throughout the game. The team that gets to a number of finger points (5-10) first is the winner. Have the new words written on the board. Each student on a team gets a number. First student on each team is 1, second student on each team is 2, etc. The students then close their eyes and put their heads on their chairs so they can't see. The teacher then erases one word on the board. The students then sit nicely. The teacher then says a number and the two students whose number is called then race to say what word has been erased. Students line up at one end of the classroom. Each student gets one money card placed on their head. When the class is working hard together, then all students must walk from one end of the class, back to the beginning without the money card falling off their head. If they are successful they get another money card placed on their head. If the money card falls off of their head then they are "Out" of the game. You can make it harder by counting down from 10, and then from 9 and so on. The last student that can complete the walk off without their money cards falling off their heads is the winner. This takes 6 pins and a ball, and is best to have a TA available to help. When working on grammar third-step, I initiate a sentence then have one student from each team finish it. For instance when working on comparatives, I will say “Henry's pink bike”. One student will say “Henry's pike bike is fast but Tony's dinosaur is faster” and the other will say “Henry's pink bike is slower than Nancy's turtle”. I choose the most creative and of course correct sentence and throw that student the ball. They then bowl at the pins and get the amount of points for how many are knocked down. The TA then sets the pins back up while the next 2 students are making sentences. It encourages creative, funny English and students have fun. I put numbers next to the vocabulary words of the day on the board. When I say a number, the students must say the corresponding word. Very simple but works on both pronunciation and numbers. A. The fastest students to say the answer can get Finger points for their team. D. Have students play 1vs1. The student that gets 2 of 3 answers quickest is the winner and is "Out"
I assign each student a flashcard, which is their word, and have them make a circle. I say one of the words then bounce the ball in the middle of the circle. The student assigned to that word must run and catch the ball before it hits the ground. If the student catches the ball, he/she is the winner and can be awarded a finger point. The team that gets to a number of finger points (5-10) first is the winner. Works on listening and is an active, fun game that the students have loved. *Be sure to have all students repeat the word after the teacher before throwing the ball again. This is a drill game for step 2, when the teacher makes mistakes to queue children to react in some way. It keeps the children focused and having fun. This is a fast paced game with the possibility of getting eliminated. Have the kids stand on a line. As soon as the teacher makes a mistake one student from each team must run to the board and sit back down. The last student in each round is out. The students slowly get eliminated after each time the teacher makes a mistake. Last team standing is the winner. If kids are not repeating properly, you can bring students back into the game from the other team. * If the class is can't run back and forth safely, Crawling is a quick and safe substitute for running. This works well for younger classes. Step 1- Ask the class "Who likes drawing?" Then pick a student and he or she must answer correctly. Step 5- After they answer all questions correctly, let them try to draw their answer. *If a student makes a mistake be sure to correct the answer, and have the entire class repeat the correct answer, then move on to let another student have a try. This game is good because, you review, who, can, like, and what can type questions. It also makes the children think of nouns they can draw. Step 2 - When you call a specific number that student must run up and gently tap the ball then race back to sit down. First team to reach 5 or 10 finger points is the winner. *If a student races up to tap the ball but does not make contact before running back to their seats they are not the winner of that round. This game worked well for my younger classes. My classes got a kick out of it. If you like to act, you can really have fun with this one. When you review the stack of flash cards, try to express different emotions through speaking the words you are reviewing. For the first few words you can pretend you are sad, so then you would use a sad voice. Cat Dog Table Chair - all in a sad voice. During the drill the teacher can give finger points to the team with the best expressions of different emotions. Step 1- Announce to the class which emotion they should express through their voices. Step 3- Switch voices and announce to the class which emotion to switch to. This drill works well for step 1 of the dd method. Step 1 - The teacher tells the class to cover their eyes. Then the teacher will hide a money card in the classroom. Step 2 - After the teacher hides the money card, the students can open their eyes. The teacher then will get into I say you say drills. Step 3 - During the drill, reward the best students by giving them 10 seconds to try to find the money card. This game worked well for my younger classes. All the students wanted to try to find the money card. For older classes you can make the students explain where the money card is exactly. For Example: The green money card is under the white chair. The teacher stands in the middle of the classroom with a Hula Hoop as a basketball hoop. The teacher can spin in both directions, (changing directions often) and also move the hoop higher or lower to the ground. The two students each have a ball and must try to get the ball in the hoop. The teacher is obviously spinning, changing directions, and moving the hoop higher or lower to try to get the 2 students to miss the hoop. The first student to get a ball in the hoop is the winner and is awarded points. After this continue with your grammar lesson again for another 4 students, then play again. *Great for all ages of children, and lots of fun to play or watch! a. Students must sit in a circle on the floor. b. Each student choses a word. Make sure everyone knows everyone else’s word. d. Once everyone has the beat together, the teacher will start by saying their word on a clap,then they say someone else’s word on the next clap. e. If your word is said, you are the next person to go. You must say your word on a clap, then someone else’s word on the next clap. f. People cannot say the word of the person who went before them. h. Last player / team in, is the winner. *** For using grammar with this game, you can have students say something like “My name is John. Your name is Lucy”, depending on the grammar being taught or reviewed. a. Students have 5 seconds to stand at one corner of the room while the teacher closes his eyes in the middle of the room. c. Last student / team still in, is the winner. i. Instead of students standing on the number you call being out, everyone else NOT standing on that number is out. ii. Play with colors. Same play and ways to win. iii. Play with flashcards. Place newer flashcards around the room and have students stand next to a flashcard. Students make a line at one end of the classroom. The teacher stands at the other end of the classroom and begins walking slowly towards one of the teams. Young classes: The team must complete one of the rhymes before the teacher reaches them. Once they finish the rhyme the teacher is pulled back to the teacher's starting line and begins walking towards the other team who must then complete another rhyme. If the team is too slow or if they don't say the rhyme properly the teacher will reach them and eat them. is too slow then that team fails and the other team gets a chance. First team to have all students make a good sentence wins. Can also work for reading / new words / questions etc. Simple game to keep students speaking. Have playing cards lying face down on the floor. If the students are being good have 2 children pick one card each and turn them over at the same time. The student with the higher card gains the difference of the cards, in points. (Example Queen, 7 = 5 points) The students then keep their cards and at the end of the drill, if they can make 10 with their cards they get extra points. Younger Students: Each student gets a flashcard and stands in a circle. The teacher says the word of a flashcard and starts walking towards the student with that flashcard. The student must say the flashcard of another student before you hit them on the head with a balloon. The flashcard the student said is then the new target of the teacher and continues in this way. The round ends when a student gets hit. The student who gets hit must say all of the words or be penalized. Older Students: Give students a specific grammar style to practice as in the past tense. The teacher starts by saying "Mark ate my homework" and starts walking towards Mark. Mark must then make a new sentence targeting a different student before the teacher can hit him on the head with a balloon. (Sarah stole my shoes) The game continues until a student makes a mistake or the teacher gets to a student and hits them on the head with a balloon. The teacher assigns two actions that he/she will do at anytime while drilling flashcards or grammar which the children must pay attention for. The main action is to indicate that the children must be silent. I usually do this by raising my leg. While the students are repeating I will at some point raise my leg. If the students repeat after me while my leg is raised, they are either deducted points or the other team is rewarded points. The second action, (touch your ear, nose, etc.) is to indicate the teams to perform some sort of task. (make a line, circle, sit down etc.) The first team to complete the action, gets points. I usually do finger points with this. The first team to earn five finger points wins the drill. *This is a great game for keeping the attention of the children and keeping the energy of the class high while monotonously drilling any words or sentences which may take time. 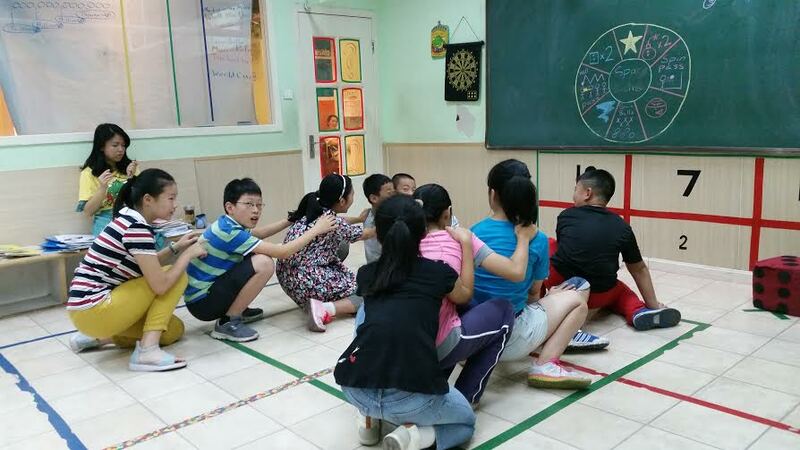 If you are losing the attention of students, remind them if they behave and pay attention, there might be some super fun game which only the good students will be allowed to play. The game should be different from whatever it is you have been doing to change the pace and inspire children to try harder. One game my kids love I call, Chickens and the Wolf. Pick the best four students who have been behaving well, they are the chickens. The teacher is the wolf. Assign a space on the floor, (maybe with a hoop or taped box on the floor) which is their "house". They are safe in their house until the teacher calls a student's name from the "house". That student must race to their seat before the teacher catches them. I personally never catch them, but instead stop immediately in front of their chair as if there is some invisible force repelling me. It's very fun and the less well behaved students will immediately want to participate in order to play. Write the new vocabulary on the board with a number next to each word. (Can push higher numbers if you want to teach numbers as well as words) The two teams of students make two lines facing the board so that the two first students from each line are in front of the board. The teacher then calls out a number that corresponds to the new vocabulary. The first student to say the word, then "BOOM" is the winner and earns a finger point for their team. The "winner" of the show down then goes to the end of their line, and the "loser" continues at the front to play again. The first team to 10-15 finger points is the winner. *If a student loses 2 times in a row have them go to the end of the line so they are not too discouraged, but still get more chances to play than others. Make a few lines of flash cards with 2-3 cards in each line. The teacher then says a sequence of vocabulary words that a student must follow as they jump from line to line. For instance the teacher says "cat, rice, breakfast, elephant". The student must listen, then jump from the "cat" flashcard to the "rice" flashcard and so on, while repeating the words themselves. If they make a mistake, jump to the wrong card, or mispronounce a word, they sit down. If a student is successful they are awarded points. Between every other round go over all the words with students repeating after the teacher. Have students sit or stand in a circle. The teacher starts with the grammar point of the day. For instance, present continuous tense. Teacher says "I am running to the bathroom... She is kicking Henry", then points to a female student (She). That student then says "I am kicking Henry... You are reading a book" and points to another student. The student must say what the previous person said about them, then say what the next person is doing. (Each student says two sentences) If a student makes a mistake they are out and sit down. The sentences get increasingly more difficult as students try to stump each other. This can be used for vocabulary, questions, or anything. Students stand up and walk in a circle. I say, they say. If I make a mistake, they all fall down. Last one standing is dead. I use this for vocab often by laying the cards down in a circle and saying the flashcards as I pass them. *With young children, it is best to have the last student standing (Dead student) lose, and award the other team a point or so, but NOT have them sit out of the game as this would have the students that need the most help, leaving the game first. Students must move around the classroom continuously while repeating after the teacher. When the teacher says “Freeze”, students must stop moving and pretend to be frozen. If they move, laugh, blink, fall, etc., the teacher must try to hit that student with a ball. Then they must respond with the desired answer. When the teacher says “Go”, students can move around freely while repeating. “I say, you say”. If a student is hit with the ball, they must repeat the last thing the teacher said. Then everyone says as a class. Then they can continue moving. If they are younger students, the teacher can say the word or phrase to remind the student what they are supposed to repeat. Option 1: Instead of the teacher saying “Freeze”, students freeze when the teacher makes a mistake. Option 2: When the teacher says “Freeze”, the teacher hits a student with a ball, then says a phrase with a mistake, then the student must say it correctly. If it is a question, when a student is hit with the ball they must say the answer. Or the teacher may answer, and the student says the question. If it is a word, the student can say it in Chinese. If it is used for a rhyme, students can say the next line of the rhyme when they are hit. If the students are older, the students can spell the word, or say the whole phrase in Chinese. For any of these steps, each team starts with 5 finger points. Each student can be given 5 seconds to say the correct response. If they cannot say it correctly, their team loses a finger point, “I say, you say” with the correct response. When a team reaches 0 finger points, they are the loser. The teacher stands at one wall with a ball. They must face the wall. Students must line up behind the teacher on the same side of the room, facing the opposite wall. When the teacher calls a color, those students wearing that color must run to touch the far wall. If the teacher hits a student with a ball before they touch the wall, they are out. Colors: students run when they are wearing colors that are said. Long hair / short hair, tall / short, fat / skinny, etc. I say, you say. When the teacher makes a mistake, students run to the opposite wall before the teacher can hit them. Student who gets hit must correct the mistake or they must sit. When the teacher says a question, students run to the wall. If a student is hit, they must answer the question or sit down. When the teacher says a word, students must run to the wall. If a student is hit, they must say the opposite word / say that word in Chinese. Place a plastic cup on the edge of a table. Have students repeat vocab / grammar / rhymes / Q n A... after the teacher. Whoever repeats after the teacher the best has 10 seconds to run to the table and flip the cup, flip cup style (From right side up to upside down). If the student can flip the cup then their team wins points. This can be used to teach any material that has students repeating after the teacher, and played many times without losing children's focus. A reward game for two students to play after reading after the teacher, doing rhymes or singing. After having the class repeat together after the teacher, the best 2 children will be chosen to play tag. The teacher sits in a chair in the center of the classroom, with a student on either side of him/her facing opposite directions. When the teacher says go, the 2 students race in a circle around the teacher trying to tag the other one. Pummel the Professor (Grammar or Vocab): This is a mistake game to be played while saying and repeating grammar or vocab. Give one student from each team a ball. When the teacher makes a mistake the students must hit the teacher with the ball, throwing from their seat. If the students miss, (As the teacher should dodge the balls if possible) they may run to get their balls and throw again from a seated position. The first student to hit the teacher earns a finger point for their team. Start the drill again with new students throwing, and continue until one team earns 5 finger points. Example: Choose one of the vocab words to be the word that initiates students to throw balls at you. Example: When you say the word "Kitchen" during your example sentences, that is the word that initiates students to throw balls at you. Derby Race (Grammar or Vocab): Have your students sit in a circle on the floor. Give one student a ball to pass around the circle. The teacher stands behind the student holding the ball. The teacher says sentences with all students repeating. When the teacher makes a mistake it is a race around the circle; The teacher must run around the circle, and the students must pass the ball around the circle. If the teacher is the winner, the students must continue with the drill repeating sentences after the teacher. If the students win, the drill ends and a student can roll the dice to play the board game. Snake-ball (Vocab or Grammar): Each team sits in a line facing the board. The first student from each team holds a ball or something to pass. When the teacher makes a mistake, students must pass the ball to the back of the line and then back to the front of the line. The ball must be passed to the right side, then the left side, to the right side and so on in a snake like motion. The first team to get the ball from the front of the line to the back of the line and back to the front gets a finger point. The team to get 3 -5 finger points first is the winner. Perfect Shapes (Grammar): Each team starts sitting in their chairs. The teacher says examples of the grammar with all students repeating after. When the teacher makes a mistake each team must race to make a perfect shape using their bodies on the floor. If there are 5 students on a team they must make a pentagon, if there are 4 students on the team they must make a square, if there are three children on the team they must make a triangle, if there are two children on the team they must make a circle. The fastest team to make a perfect shape gets to lose one teammate. (One teammate sits out for next mistake challenge) The team to get down to one student left on their team first is the winner. *Teams can lie on the floor or sit on the floor using their legs to make shapes. Mike or Not Mike (Game after teaching Drill of any kind): After the team has completed an educational drill they can play the "Mike or Not Mike" game. The team stands up and must catch the big dice, or a ball that the teacher throws to them lightly. The teacher says a students name, or "Not" a students name. If the students name is called, that student must catch the dice, or ball. If the teacher calls "NOT..." then the other students from the team must catch the dice or ball. Each catch is a point, and the game goes until someone makes a mistake or someone drops the ball. Hand Wave / Dip Wave (Vocab): Students sit or stand in a line so that all can see the vocab, whether they are flashcards, or written on the board. When the teacher makes a mistake students must do a wave from the first student down to the last student. (Stand up and put hands up one at a time from the first student to the last student like at a sporting even in a stadium) Or the dip Wave of doing a squat in order from the first person, down to the last person (Standing in a line). *Fun Drill that will have kids enthusiastically repeating words after the teacher and doing actions until the mistake comes and then the Wave starts! Zip It Flashcards (Vocab): This is a say and repeat drill or a drill where students see flash cards and speak without the teachers help. The first student to yell "Zip it" is the winner and can sit on the floor. The game continues until one team, or the whole class makes it to the floor. If a student makes a mistake with speaking LOUDLY, or QUIETLY then they must return to their seat. *If a student is not talking or paying attention that student should return to their seat, OR someone from their team should return to their seat. *Easy and fun drill for younger students, it can be easy, where students repeat after the teacher, or difficult where students just say the words as they come without the teachers help. *I don't like to hear students say "Shut up", so I played this game to introduce a different way of saying that... Zip it. As in zip your mouth shut and be quiet. Team Bowling (Vocab or Grammar): This is a mistake game that may be used for teaching vocab, grammar and other things. One student from each team will get a ball. The teacher will be saying vocab, or grammar sentences and having children repeat after. When the teacher makes a mistake the "Team Bowling" starts. The idea is, that when a mistake happens all children will jump out of their seats and each team will make a line standing with their legs open. The student with the ball must roll the ball through his/her team's legs to win. The first student to bowl the ball all the way through their team's legs first is the winner. The winner can be awarded finger points, or points on the board. After each mistake, have students switch who the bowler is. Continue until all children have had a chance to be the bowler. Circle of Embarrassment (Grammar): This is to practice grammar after it has been taught. Children sit in a circle on the floor. Each student must say 2 sentences, one about themselves , and one about the person next to them. Then the next student must repeat the sentence that was said about them but switching the pronoun from he/she to I..then add a new sentence about the next person. The point of this game is to work on switching verbs such as He plays to I Play or She likes to I like when repeating the prior sentence. First student: I like to play basketball. He likes to eat dogs. Second student: I like to eat dogs. She likes to kiss monkeys. Third student: I like to kiss monkeys. He likes to wear dresses. Fourth student: I like to wear dresses. She likes to swim in the toilet. In this Drill I encourage children to say crazy things to make it fun. I will normally give an extra point for the more creative things children come up with. *The GOAL of this drill is that when everyone can say and repeat their sentences without making a mistake then we will play a fun Board game that everyone wants to play. The teacher starts with making a Rhythm for students by clapping, stomping, hitting knees...(Or a crazy as you want... end with a cheerleader jump) Easy Example Rhythm: Two quick claps... 2 slow stomps. Teach all students how to do the rhythm first until all students can do it without speaking. Then Teach students to add the sentence to the rhythm by adding a word to each clap/stomp. Once children understand how to do it, and have said 5-7 examples together it is now time for students to do their own. Each student attempts to make their own sentence using the same rhythm. If they do it perfectly they win and are "Out". Once a student has made a good sentence, with the proper rhythm have all students repeat it together and then continue with other students trying. When all students have made a sentence to the rhythm correctly the drill is done. *If students are getting bored, or it is too difficult, switch the rhythm in the middle of the drill so that it is fresh and new again for the 2nd half of students that still must make a good sentence and rhythm to get "Out". Cross Over (Vocab): Students all begin in their seats. Their must be a Center line going across the floor in front of the students. The teacher goes through the vocab flashcards (Or vocab written on the board). If the teacher makes a mistake all students must race to the line and sit nicely on the line on the floor. The first student to be sitting nicely on the line is the winner, and remains on the line. All other students must return to their seats to play again. This drill continues until all students from one team has made it across to the center line. *If students that have "won" and are sitting on the center line do not continue to repeat after the teacher or sit nicely, then they must return to their seat to partake in the races again. Fill In the Blank (Grammar): After teaching the vocab words and their meanings. The teacher can say and or write a sentence with a word missing. Students must figure out which word should go in the blank and say the sentence in full. EX: Easy: I like to eat BLABLABLA. Students guess which food word goes in the blank. Difficult: Yesterday I BLABLABLA with my friends at school. Spin the Bottle (Vocab): After the teacher teaches the new vocab and meaning have all students sit in a circle on the floor. The teacher spins the bottle first to choose a student. The student that the bottle points to is "IT". The student must try to say all of the words in English correctly. If the student makes a slight mistake they lose. The class will then all repeat the word correctly after the teacher a few times. The student that lost then gets to spin the bottle to choose the next student. Slap Chair ( Questions): One student from each team sits on the floor next to a small stool. Students put their hands on their heads. The teacher asks a question. The student that slaps the chair first, gets to answer first. The student who answers correctly first is the winner and stays seated on the floor next to the chair. (If the first student to hit the stool answers incorrectly then the other student gets a chance to answer) The loser goes back to their seat, then the next student from that team sits next to the stool to play. Each time a student wins, I give them a finger point. The team that gets 5 finger points first is the winner and is awarded points. Spin the Bottle (Questions or Grammar): Have students sit in a circle on the floor. The teacher has the class say a question all together as a class. The teacher then Spins the bottle. The student that the bottle points to is "IT". If the student can answer the question perfectly they win and are "OUT" and sit in their seat. The class then repeats the correct answer together as a class. This continues until one team has won and are all seated in their chairs, or until every student has won and is sitting in their chairs. *This is a great way for students to learn from each other's mistakes. If a student answers incorrectly the teacher should say the correct answer and have all students repeat the correct answer. *Be sure to have all students repeat the questions together prior to spinning the bottle, and repeat the correct answers together otherwise students will not be learning as quickly, and not getting to practice English as much if only getting to speak when the bottle chooses them. Clap Kill (Grammar): Each team sits on the floor in two lines sitting across from each other. The teacher says sentences using the grammar of the day. If the teacher makes a mistake students must clap and then use their hands to make a gun pointed at a student from the other team. The fastest student gets a chance to correct the sentence. If the sentence is said correctly by the student then he/she gets to kill one student from the other team. (That student is then "OUT" and sits in their chair) The first team to eliminate all students from the other team is the winner. Describe the Word (Vocab): After the teacher has taught the vocab's pronunciation and meanings, have all students sit on the floor. The teacher then talks about one of the vocab words of the day. The teacher can describe the word, make example sentences replacing the actual word with BLABLABLA, say antonyms or synonyms... If a student raises his/her hand first they get a chance to guess which word it is. If they can say it correctly they are "OUT" and may sit back in their seat. After each round, have students repeat all the vocab words together quickly to refresh their memories of how to pronounce each word. The game can continue until one team has won and are all seated in their chairs, or until the entire class has answered a round correctly. *After each round the teacher says, and students repeat all the vocab words, so this is an easy way for all students to get practice at speaking the new words. # Up or Down From ________ (Vocab): The teacher writes the new vocab on the board vertically. After quickly teaching the pronunciation and meanings of the words the teacher should have all students sit near the board. The teacher then says a number UP or DOWN from one of the words on the board. The first student to yell out the answer is the winner. This should be played quickly and having all students yelling the answers at the same time. The teacher can have the fastest children sit down and be out, or simply give a point on the board for the fastest student each time.